or better known as “staging patches”. So you created some new functionality in a file but you have a lot of other code you’re not quite ready to commit yet. Answer: git add -p . It will interactively go though modified sections of your file asking if you want to “stage this hunk”. Answer y for yes, n for no, q for stop, then commit as usual. You can even split hunks if you want to get more fine-grained. For more details check out this page. 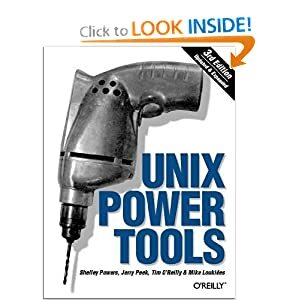 Just finished the 1000+ pager Unix Power Tools, Third Edition book over Christmas break and found it a pretty good complete general introduction / refresher to Unix / Linux. I originally passed the book up as it was last updated in 2002 but my interest was piqued skimming it and in the end I found that 98% of it’s contents still relevant today. It was like having lunch with a old-time unix guy – all the command line stuff just runs faster these days and he talks about screen instead of tmux, etc. Additionally, interesting history and tips were given on some unix programs (for ways of dropping out of a shell script faster since back in the day CPU cycles were rented). Sometimes I need to modify the output of a program but also want to keep a copy of it’s unmodified output. Tee does that for me in one go. Though emacs has the ability to run a shell inside (three different ones actually), anything that requires more than just a “dumb terminal” doesn’t work as well as I’d like in these emulated terminals. My research in finding a solution has lead to some creative answers such as using tmux (thanks Takashi) which on its own solves and improves tons of daily workflow situations. I, however, will dedicate that topic in it’s entirety to another entry as it does add some optional complexity to your workflow; too much if you’re looking to solve just this one problem. In a previous project I used a bash script in conjunction with a git hook to concatenate all my js files and increment build numbers in html file references (cache-kill) after every commit. This was convenient at first, but quickly got annoying as I wasn’t always committing js file changes. I eventually opted to just call the script manually before any deployment to qa or production, thinking I would automate it again one day to only be called when JS files were changed (git hooks probably provide this info). I’m optimizing the web views of an iPhone app in preparation for Christmas traffic and one of the ideas I had was to use small increments of Expires header to cache files client-side. I assumed this would be no problem as all my work with Safari on the iPhone has shown it a very capable browser—as good as any desktop one. Turns out after some testing that using Expires Header isn’t possible— not because of cache size limitations as one would assume. It looks like the guys in Cupertino wanted to limit this ability on the iOS as every HTTP request made by an iOS device issues a pragma: no-cache directive. I’ve yet to understand why. Better fire up more memcache servers.